Nokia announce the Asha 501: Social, inexpensive and a fresh new UI! Today Nokia have unveiled their latest budget Asha handset! It seems as though while Nokia go after the high end with their Lumia handsets they've had to ensure that they keep making sales in the budget end of the market to sustain their income and keep the tills ringing! It seems that this phone and its software actually took a large leaf out of Meego's book. There's a few funky features such as a double tap to wake and there's two home screens: one being 'fastlane' and the other being the app drawer and you can swipe between the pair. Apparently the new OS will support Facebook, Foursquare, Linkedin, Twitter and Youtube right from day one, something which the Finns hope will reiterate the social credentials of the phone. On the spec front things are about what you'd expect with a budget device. There's a QVGA touchscreen which is 3" and has a QVGA, that's 320 x 240p, and it's capacitive with two-finger multi-touch. The back houses a 3.2MP fixed-focus camera and there's a MicroSD card slot which supports cards up to 32GB in size, although Nokia haven't specified the internal storage size. As you would expect with this sort of device Nokia have added some data saving options. One is the Xpress browser which compresses data for faster delivery and the other is a partnership with Facebook and Airtel in India, which lets people access the social network for free without a data plan, but this deal is for a limited time only and only the first sales will have this feature. Other highlights include a dual-SIM option and Bluetooth 3.0. The only issues we can see with this phone are the lack of 3G data and how well it will stack up against budget Android handsets. On the plus side the 1200 mAh battery should be more than enough to get you through the best part of a week with light usage! If you're interested in picking up one of these then the Asha 501 will land in 90 countries on 60 operators in June and will set you back $99 before taxes and subsidies for the single-SIM version. If 3G is a necessity then Nokia have promised more Asha 5xx phones will arrive soon with that option! For those of you in America or Canada though, you can definitely rule out this coming to your country unless you're prepared to import one! 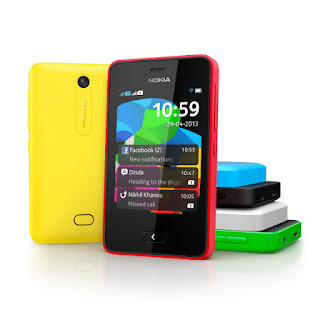 Via Nokia, Slashgear and GSMArena.